BRUT, Best Rigid Universal Thumb – An inexpensive, adjustable, non-hydraulic, weld-on mechanical thumb. Mostly for larger machines, it has it’s own main pin and weld-on base plate. Unique, Integrated Design – This mechanical thumb folds and stores right on the dipper stick of backhoes and excavators. When not in use, the BRUT series thumb, and its components, are designed to store entirely into a single, integrated unit, right on the dipper stick. 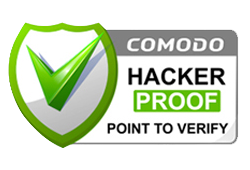 This unit eliminates an operator’s number one headache – storing the thumb. 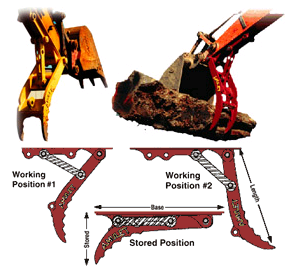 Bolt-on models available for standard-stick Case backhoes and other un-weldable sticks. 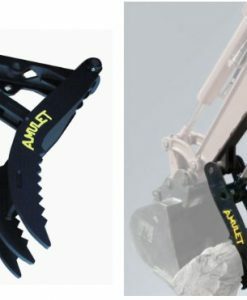 Designed for those who do not require the independent control features of mechanical hoe clamps or hydraulic power clamps, the BRUT is an excellent alternative for contractors looking for a grappling device that is heavy duty in design and easy to use. Built to excel in demolition, placing rip rap, brush and log handling, scrap and recycling, etc. This is your basic thumb, affordable and practical. 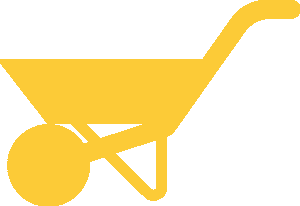 This unit does not require disassembly and removal of the heavy support strut and its pins, nor does it require the inconvenience of storing the parts in a separate location. If you’ve ever tried to hunt down loose components, you’ll quickly see why the BRUT is so much better. Three-position adjustment. Two tines. Two fixed working positions and one for out-of-the-way storage for digging. Independent main pin. Weld-on base plate. Two tines. Three-position adjustment. Two fixed working positions and one for out-of-the-way storage for digging. Independent main pin. Weld-on base plate. Two tines. Three-position adjustment. Two fixed working positions and one for out-of-the-way storage for digging. Independent main pin. 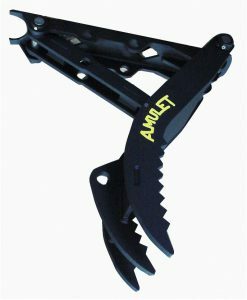 Amulet NT6 (Nitro) Series Rigid Mechanical Thumb, NO Weld-on base plate. Three-position adjustment. Two tines. Two fixed working positions and one for out-of-the-way storage for digging. Independent main pin. – Independent main pin. Weld-on base plate. – Two models – for with or without bucket coupler.